Some small species of salamanders are lack lungs. If they have lungs, as the tiger salamander does, they pump air in and out by gular pumping (lowering and raising the floor of the mouth). Salamanders do not have fracture zones in their tails as some lizards do, but are able to regenerate entire limbs. Regenerated parts are usually distinguishable by the lack of characteristic pigmentation. 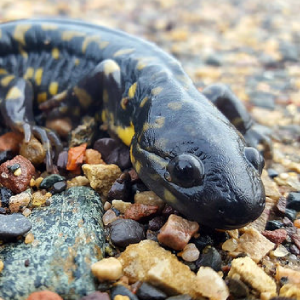 Photo by USFWS Midwest Region (https://www.flickr.com/photos/usfwsmidwest/29527619454). Photo has been cropped.